July may be nearing its end, but All-Star season isn't over yet. Ryan Vilade, the Rockies' No. 7 prospect, and Dodgers No. 13 prospect Starling Heredia headline this year's group of Pioneer League All-Stars, the Rookie-level circuit announced Tuesday. The Pioneer squad will take on its peers from the Class A Short Season Northwest League on Tuesday, August 1 at 10:05 p.m. ET in Hillsboro, Oregon. Vilade, tapped as the team's starting shortstop, did not wait long to capture his first Minor League accolade. 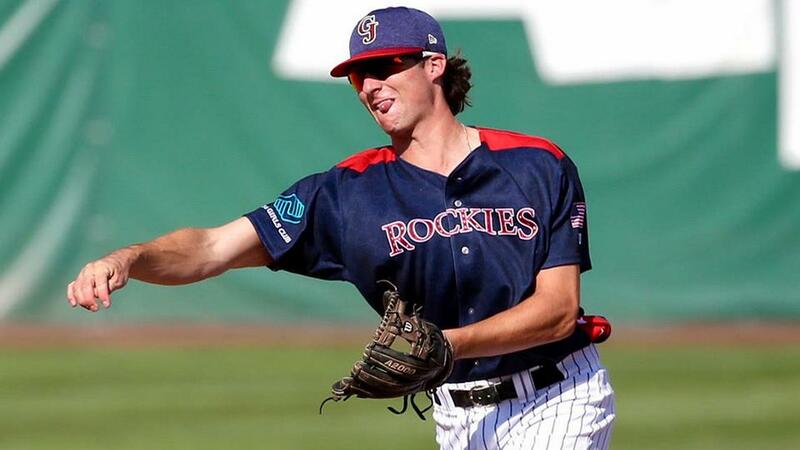 Coming out of Stillwater (Oklahoma) High School, the 18-year-old was taken with the Rockies' first pick in the 2017 Draft (48th overall) and signed for the slot bonus of $1,425,400. Without a complex-level affiliate in the Arizona League, Colorado pushed Vilade to the Pioneer League, where he's thrived. He leads the circuit with a .465 on-base percentage and ranks fourth with a 1.047 OPS through 22 games for Grand Junction. He'll be joined by double-play partner Shael Mendoza, the Rockies' other Pioneer League All-Star starter. Heredia is one of a league-high three Ogden Raptors to make the starting squad. Signed for $2.6 million out of the Dominican Republic in 2015, the 18-year-old outfielder has impressed in his first stateside season. He spent seven games in the AZL, going 12-for-28 (.429) with six extra-base hits, before moving up to Ogden on July 5 -- and he hasn't cooled off. The right-handed-hitting slugger owns a .422/.500/.766 line with four homers, one triple and eight doubles in 15 games since joining the Raptors. Ogden's other starters are catcher Hendrik Clementina and designated hitter Luis Paz, who leads the league with 10 homers, a .768 slugging percentage and a 1.185 OPS. Angels No. 25 prospect Elvin Rodriguez was named the starting pitcher for next Tuesday's showcase. The 19-year-old right-hander leads the league with a 1.06 WHIP and ranks fourth among qualified pitchers with a 3.44 ERA over seven starts. He's also struck out 32 and walked just six in his 34 innings for Orem. He won't be the only ranked Angels pitching prospect in Hillsboro as No. 7 Chris Rodriguez (4.94 ERA, 1.16 WHIP, 30 strikeouts in 31 innings) also made the Pioneer staff. The Northwest League is expected to announce its All-Star roster tomorrow. The game will be streamed live on MiLB.TV.